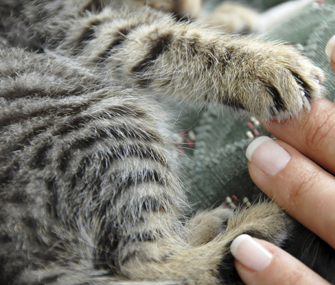 While clawing is a normal feline behavior, it is not always understood or accepted by some cat owners. Cats use their claws for many purposes. They scratch surfaces to scrape off old nail layers. Their scratching provides both visual cues and scent indicators to claim prized territories in the home, such as the arm of your sofa. They use claws to capture and hold prey, be it a stray mouse in the house or your ankles or a fast-moving feather wand toy. 1. Trim your cat’s nails regularly. Dull claws cause less damage than sharp ones. Start by handling your cat’s paws gently. Press the pad to express the claw and use a cat clipper or designated human nail clipper to snip the curved end of the nail. Avoid cutting the pink area of the nail known as the quick, to prevent the nail from bleeding. Gradually introduce nail-trimming time with your cat by clipping one or two mails at a time. Be calm and patient, and praise your cat to make this a pleasant experience for both of you. 2. Heed the 1+1 rule. For multi-cat households, it is essential to provide a sturdy scratching object for every cat plus one. The reason? Some cats are quite territorial and do not like to share. Place these scratching posts and cat trees in various locations to prevent a bully cat from guarding them all. 3. Locate scratching posts in cat-welcoming areas. Cats scratch to say, “Kilroy Kitty was here.” They desire to display their scratch graffiti in visible and highly trafficked places in the home. So place scratching objects in the living room and near windows, feeding stations and litter boxes, instead of in a dark corner of a basement or a rarely used back room. 4. Pick the preferred post. Choose scratch objects that match your cat’s texture preference as well as scratching style. Watch how your cat scratches. Some cats prefer opportunities to scratch horizontally, vertically and at an angle. Notice what texture he prefers. Is it upholstery, carpeting, soft fabric or wood? And invest in a sturdy scratching post that won’t tip over easily and accommodates your cat’s full-length stretch. 5. Redirect your cat’s claw target. If your cat has been scratching your sofa, position the scratch object directly in front. Next, make the sofa unattractive by temporarily applying double-sided sticky tape that feels nasty to paws, or bubble wrap that makes popping sounds. Cats have sensitive noses, so you can also try spraying citrus scents or applying baby powder or cinnamon on your furniture. Finally, interrupt wrong behaviors with a hand clap, and then redirect your cat to the right object and offer praise. 6. Move posts gradually. Once your cat gets into the habit of scratching the correct object, you can slowly move the post to a better location. But go slowly. Move the post no more than six inches a week, to reduce the risk of your cat returning to claw your sofa again. 7. Reward routine. Cats are creatures of habit. They often scratch after meals, naps, when you come home and after play, so plan claw-training during these times. Drag a feather or ribbon to lure the cat to use the legal object. Scratch the claw surface yourself to encourage her to copycat your behavior. Spike the scratch post with organic catnip to make it more appealing. And, finally, don’t be quick to replace a tattered scratching post. Most cats want to admire their handiwork. Amy Shojai is a certified animal behavior consultant and the award-winning author of 23 pet care books, including Complete Kitten Care and Complete Care for Your Aging Cat. Shojai also appears on Animal Planet’s CATS-101 and DOGS-101, writes for puppies.about.com and cats.about.com, and lives in North Texas with a senior citizen Siamese and a smart-aleck German Shepherd dog.